Reel Pleasure Charters is fully outfitted to bring some of the best Great Lakes fishing excitement to our valued customers. We even clean and bag your catch! Reel Pleasure offers full and half-day fishing charters for trout and salmon at Manistee, Michigan. We have specialized Brown Trout charters available in the Spring (April-May) and exciting off-shore Steelhead fishing charters available during the Summer (June-July). 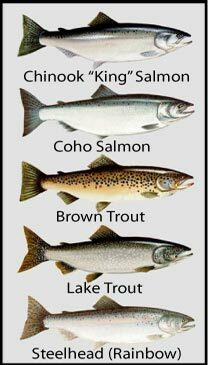 July and August are popular for the hard fighting adult Chinook Salmon or "Kings". During late August and early September, a majority of adult Kings move from the lake into the rivers, making the feisty Coho Salmon more of a prime target. Lake Trout are typically active during all months of the fishing season. On the Reel Pleasure, customer satisfaction is very important to us! We operate with an experienced captain and crew, making our customers' fishing enjoyment and safety our top priorities.